I was honoured to be asked to present at Waddesdon Manor for their ‘Horrible Halloween’ celebrations during half term. They actually made the Wednesday into Isadora Moon day, and asked me to do four presentations as well as book signing! It was a full-on day, with four sessions followed by book signings. And I didn’t even have my events helper, Henry there. Unfortunately, he came down with a bug the night before and had to spend the day on the sofa. My mum was supposed to be looking after Celestine while we both drove to Waddesdon manor, but she and Celestine ended up coming with me instead. We set off early in the morning, and drove through the curling mists at the start of a beautiful October day. When we arrived, the manor itself was stunning, all gothic with turrets and spires. I immediately knew Isadora Moon would feel right at home here. Me in my costume outside Waddesdon Manor house! The grounds were absolutely huge and beautifully landscaped with manicured lawns, neat borders, and majestic trees. I’m sure Celestine must have enjoyed being pushed round it in her pram. I wish that i had had more time to look round it. One day I will go back to Waddesdon Manor and visit it properly! I arrived and discovered that I would be doing my sessions in a big stripy red and white tent (almost the Isadora Moon colours!). I love this candycane-coloured tent! It was decorated wonderfully inside with Halloweeny pumpkins. They had really gone to town on the pumpkins for Horrible Halloween! We put up some Isadora Moon posters and bunting and set up the Powerpoint in an area called the stables. There was a courtyard type place with cafes and a shop and things around it. 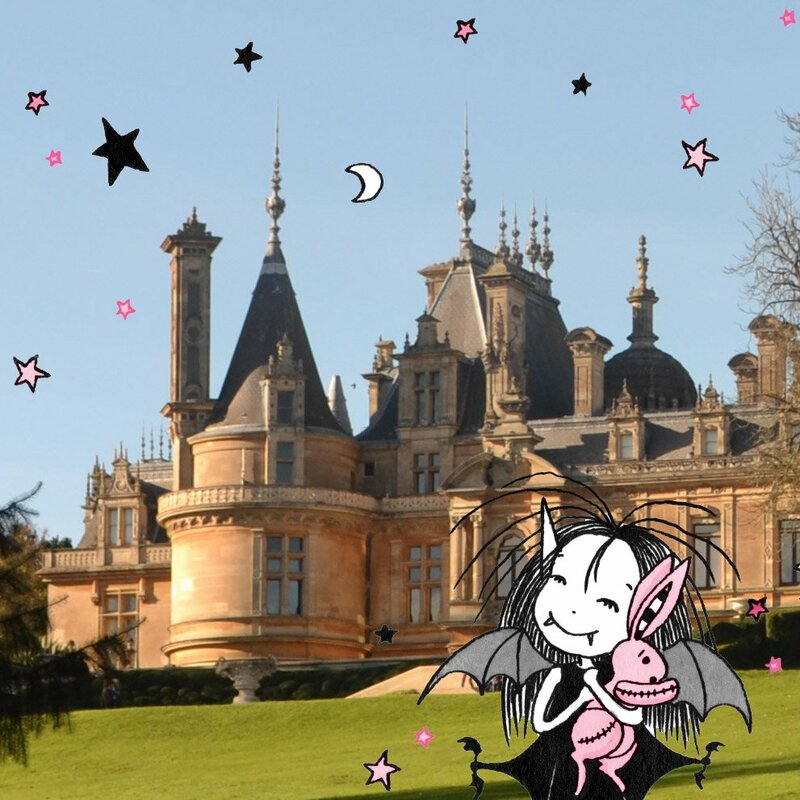 Around the stables, the Waddesdon Manor staff had hidden an Isadora Moon treasure hunt. It consisted of pictures from the books put in places for the children to try and find. There was a long table of Isadora Moon books to buy set up there too. Hay bales were set out in the stripy tent for the children to sit on. Overall it was an absolutely wonderful day and I hardly had a second to stop and take it in! I was either doing my workshop with the children and their parents – teaching them to draw characters from the book and playing Isadora Moon games with them or I was signing books. It was a full on day and I was tired by the end of it, but it was amazing! I am so happy that Waddesdon Manor wanted me to bring Isadora there! Thank you also to Oxford University Press for organising it for me and being there too. Happy Halloween from Isadora Moon! I love that some children even made Isadora Moon-themed pumpkins!